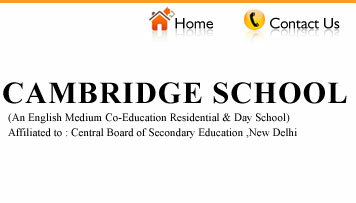 The school is affiliated to Central Board of Secondary Education, New Delhi upto +2 stage in science. The school has adopted C.B.S.E. curriculum and prepare students for ALL INDIA SECONDARY & SENIOR SECONDARY EXAMINATIONS. English is the medium of instruction and examination of all levels. The national language Hindi is also given due importance. Modern facilities for Computer Education have been provided to keep students abreast with modern education right from the beginning. The school has well equipped laboratories. Regular practical classes are held in Physics, Chemistry, Biology, Geography, Psychology and Home Science as per the norms of C. B. S. E.
The school has well equipped library. Sufficient number of books, Periodicals, Newspapers and Magazines are provided to help students, cultivate reading habit and become up-to-date in respect of current information's and knowledge. Keeping in views the C. B. S. E. norms provision has been made to impact creative learning in Art &Music. Facilities for out door games such as Cricket, Hockey, Football, Kho-Kho, Kabaddi, Volleyball & indoor games i.e. Badminton, Chess, Carrom etc and Athletics have been provided along with elaborate arrangement for Physical Education. Games and P. T. are compulsory for students. Qualified Physical Education teachers have been appointed. Courses of Physical Education is taught as per the C. B. S. E. syllabus. The total capacity of School Hostel is to accommodate 800 boys and girls with separate arrangement for the girls. Wholesome food is provided in the hostel. Special Coaching is provided to the boarders. There is tight security arrangement in the hostel. Boarders are provided preliminary medical aid during emergency and are immediately admitted in Mahadevi Birla Hospital, Mahilong when they fall sick. Assembly starts with prayer & end with the National song. Students are encouraged to talk on the thoughts; of great leaders and current topics. Daily news is read by students in turn in the assembly. Apart from the teaching schedule of the school, supervision classes & coaching are held in the school during evening time daily and during holidays. Supervision classes are held during day time also. Remedial classe for weak students in core subjects are arranged from time to time. Special arrangements has been made for weak students for their better education. Monthly progress report of every student is sent to respective guardians giving details of marks secured in each subject. The school provides special opportunities to the students unable to get proper education due to their poverty or physical unfitness. A student should have a minimum of 85% attendance for promotion to the next higher class, along with required achievement. Week days 9.30 a.m. to 3,30 p. m. Sunday 10.30 a. m. to 3.00 p. m.
Boarder students are allowed to talk to their parents on phone only on 2nd Saturday and Sunday between 7 a. m. to 1.00 p. m. and 2.30 p. m. to 5.00 p. m. Phone calls on other days will not be entertained. Kamla Nehru Vidya Mandir, has donated 20 acres of land where expansion programme has already been taken up. The expansion programme includes construction of swimming pool, gymnasium, expansion of play field, boys hostel, teachers quarters, guest house for parents, new administrative building and extension of class room, library and laboratories.